The Analogue Press is a small press publisher of comic books. Based in the North East of England, we aim to showcase the best in local and national talent. We are dedicated to producing beautifully designed comics with the highest possible production values. We love good comic books and that’s what we want to make. You probably won’t see a superhero in our comics (not that there’s anything wrong with them!) but otherwise anything goes. 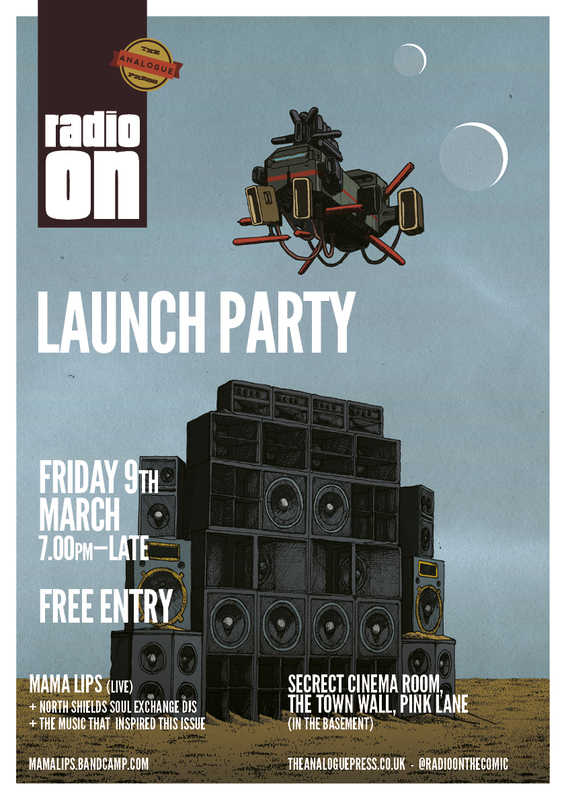 Our first publication is Radio On, an annual anthology of graphic storytelling based loosely around the theme of music. Three Broadcasts have been released so far. Eyes left for details about the launch of the fourth. For further info, check out the Radio On page. Keep an eye on our blog for details of future projects from The Analogue Press in a range of genres and styles. If you’re interested in contributing to future Broadcasts of Radio On, or want to make enquiries about future projects, then check out our contact page.